I’ve often wished I could understand what my cats were saying but I should have known! 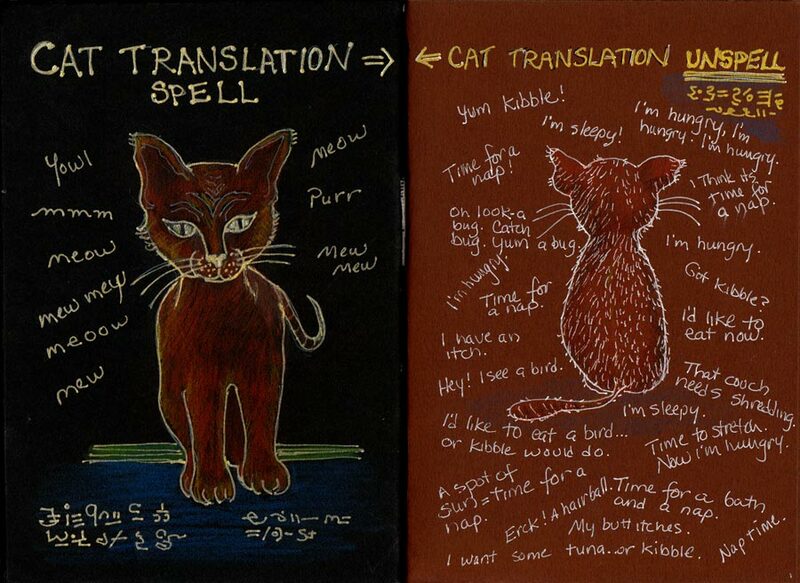 Fortunately the Cat Translation Spell has an Unspell to reverse the effects. This is another page in my Fake Journal for International Fake Journal Month. I was excited to get to this page where the black paper transitions to the brown pages. It’s so much fun drawing with white and gold gel pen on the black and colored pencil works beautifully on both of these papers. Oh I’m loving this, so cute. I think we have all wondered what our pets would say but it’s probably best we can’t. I agree completely. And also that some of it would be bleeped on TV. Thank you for a good laugh on Friday afternoon! The couch does indeed need shredding – how could I not have noticed?! Oh, and your paintings on the last post are all wonderful! Nice! I’m sure if we knew what our pets were thinking at all times it would drive us insane! I always tend to think that my cats are swearing at me. Jana, I loved this spread, the colored pages shifting, the front and back of the cat! I agree with you, Libby. Not only swearing but nobody can give us the finger like a cat.